The Vigil is a two-part performance that took place at the University of California Irvine Art Gallery and Los Angeles Contemporary Exhibitions (LACE). 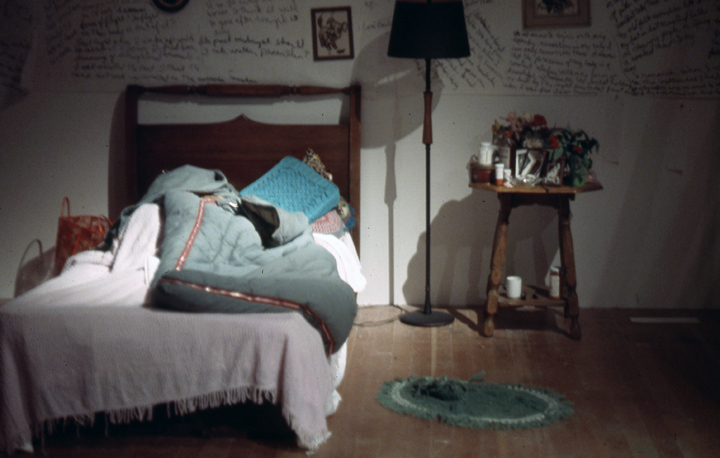 For the first part, Lacy and Smith invited audience members to attend an all-night vigil with their sleeping bags, to watch the performers, talk in- formally amongst themselves, and to sleep. Lacy, dressed as an elderly woman, tended a wrapped body in a bed on one side of the room, while on the other side Smith, dressed as a young girl, played with toys on her bed. Throughout the evening and into the night, both women slowly approached each other by writing an interior monologue—immediate thoughts and physical sensations as streams of consciousness or a meditation—upon the wall of the gallery. As the night wore on, this writing, punctuated by returning periodically to their respective beds, progressed until they met at 4:00 AM. The visitors were by then all asleep when the artists furtively unwrapped the body in Lacy’s bed, a lamb carcass, and suspended it from the ceiling. The bandages formed great soar- ing wings across the space and they sat, rocking in chairs, underneath, waiting for the audience members to awake. The second part of the performance took place during a busy opening at LACE. Lacy and Smith, dressed in white, their faces stained a similar pale color, with elaborate ceremony and perfect silence consumed the cooked shank of the lamb using their hands and an assortment of ritually arranged condiments. While they ate, a series of artists and scholars came into the space and performed individual interpretations on what the artists were doing—using their respective fields of literature, theater, performance art and so on to craft fanciful and far-flung interpretations. The Art Gallery at University of California at Irvine and the Los Angeles Contemporary Exhibitions (LACE), Irvine and Los Angeles, California.